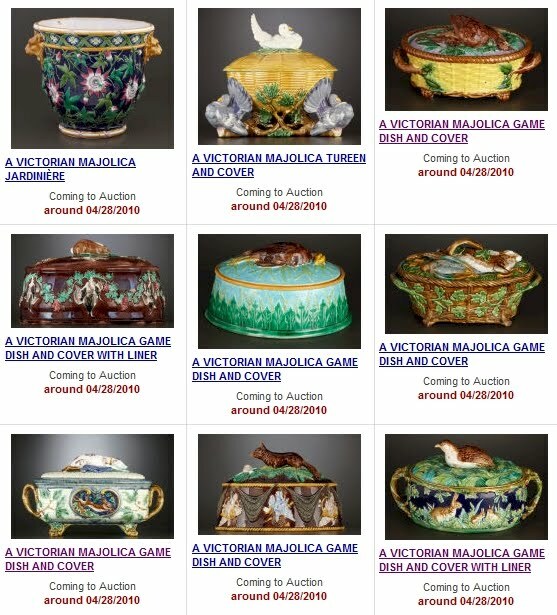 On Wednesday, May 26th, Heritage Auction Galleries will offer a selection of over 100 pieces of Victorian Majolica and Palissy ware consigned from American private collections in a live and online auction. The Majolica is mainly English with a strong showing from George Jones, and features a good selection of game dishes, cheese stands and covers, and decorative English Majolica, together with a small but high quality assortment of French Palissy ware that includes several signed pieces and a charming group of Delphin Massier. High-resolution, zoomable images and complete descriptions are available online at: www.HA.com/5039. MIS Convention-goers and local collectors will be treated to a special evening preview of these lots on Friday, April 30th, from 5:00-7:00 p.m., at Heritage’s Design District Annex, 1518 Slocum Street.